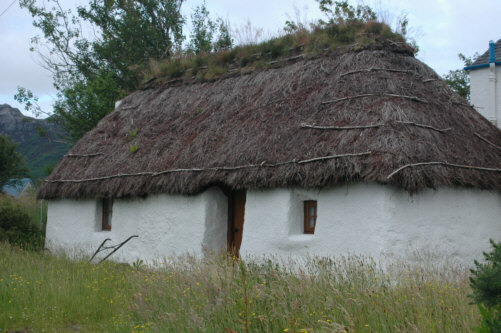 This is a picture of a thatched cottage in Plockton. Plockton is a small Highland village located on the western seaboard surroudning a sheltered bay in Loch Carron. Most famous as the setting for the BBC television series Hamish MacBeth, this peaceful Highland community in the Gaelic heartland was once based on fishing and crofting. Regularly visited now by tourists and artists seeking inspiration.